Looking for an enjoyable bike ride during your vacation to Maui? While the Olowalu petroglyph bike ride rewards with opportunity to experience historic Hawaiian petroglyph, the 'moderate' bike ride is noMaui Bicycle Vacation, Lahaina to Olowalu Petroglyphs Maui Bike Ridet overly time consuming. This Maui bike ride is a great way to see one of Maui's historical sites while enjoying a bike ride in Maui. The beginning of this ride is paved road running along the ocean until you get to Olowalu. Then, you'll ride dirt on a short moutain bike trail ride out to the petroglyph site. Begin at West Maui Cycles, where we'll set you up with either a high performance mountain bike rental or a Specialized Comfort bike for your bike ride to the Olowalu petroglyph. 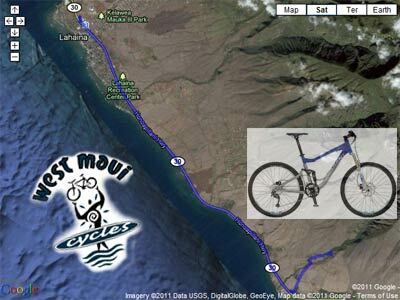 First, stop at West Maui Cycles to pick up any last second riding supplies (need a spare tube) or rent a bike in Lahaina. From the bike shop, ride south on Highway 30 out of Lahaina Town towards Kahului. Just out of Lahaina, the road narrows into two lanes to provide an oceanside scenic bike ride to the Olowalu Petroglyph. At the south end of Lahaina, Puamanu is the first beach park on your right. After riding approximately 3 miles out Lahaina, Launiupoko beach park is on the right at the only stop light after leaving Lahaina. When you see the Highway 30 Mile Marker 15, approximately 6.0 miles from West Maui Cyles bike shop, you'll notice a group of large trees shading the highway. Take a left just before the Olowalu general store and ride on the Olowalu Village road behind the store. Look for the Olowalu Petroglyph cultural site sign. Just before the old water tower, turn left onto a dirt trail and ride toward the Olowalu valley. The petroglyph will be about a third of a mile up the road on the right. Believed to be more than 300 years old, approximately 70 petroglyph drawings are visible. Be careful and plese respect this cultural site. The handrail and wooden platform are unsafe and should not be used! Carry plenty of water and a spare tire tube. The Olowalu Petroglyph are only a short ride from Lahaina town, a fun half day ride for intermediate bike riders and aggressive beginners. Leisure and beginning riders may want to enjoy a full day riding while enjoying stops at Puamana and Launiupoko beach parks to break up the segments with ocean swimming. Consider riding to the petroglyphs in the morning. Stop in Olowalu, grab a sandwich from Star Noodle's sister restaurant, Leoda's Kitchen and Pie Shop to eat a picnic lunch at the petroglyph. Then, on the way back from the petroglyph, make another stop at Leoda's for a pie before the ride back to Lahaina. Work off lunch with with refreshing dips at Launiupoko and Puamana beach parks during the bike ride back into Lahaina. NOTE: Leoda's Kitchen and Pie Shop is scheduled to open in Fall 2011. Have you done this Olowalu Petroglyphs bike ride on Maui? If you enjoyed this Maui bike ride recommendation or have questions about renting a bike on Maui, please leave comments below. Review other Maui trail maps and bike rides. Subscribe to our Maui Bike Blog for the latest Maui bike news and updates.